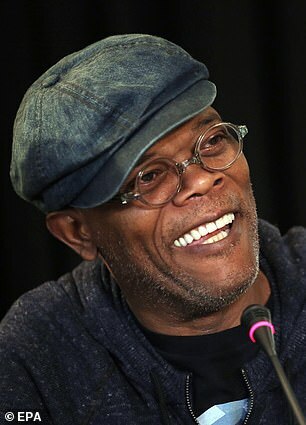 Samuel L. Jackson, the man who used the term mother f***er countless times in his movies, has taken his favorite profanity to endorse its usage against the president after a congresswoman did the same. During a speech last week just hours after her swearing in, Representative Rashida Tlaib called the president mother f***er as she was giving a speech in which she said Trump should be impeached. 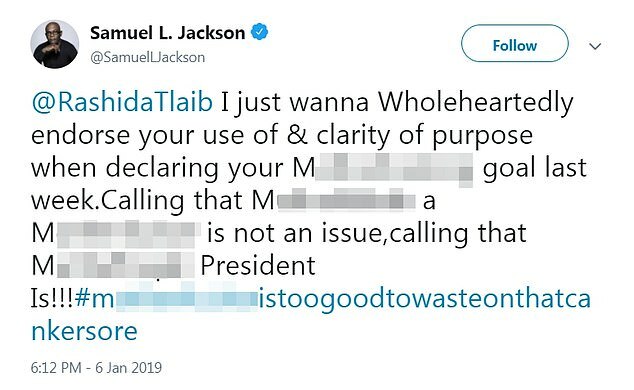 In a profanity laden tweet, Jackson shared to Tlaib ‘I just wanna Wholeheartedly endorse your use of & clarity of purpose when declaring your Mothef***ing goal last week,’ Jackson posted on his Twitter page late Sunday. ‘Calling that Muthaf***kah a Motherf***ker is not an issue, calling that Muthaf***ah President is !! !#motherf***eristoogoodtowasteonthatcankersore,’ he emphatically concluded. Jackson, who is famous for his ability to drop the F-bomb with panache, tweeted to the missive to Tlaib Sunday night. Last weekm after being sworn in as Michigan’s newest Democratic representative, Tlaib used the swear word while speaking to her crowd of supporters at the event sponsored by MoveOn. ‘And when your son looks at you and says, ‘Mama, look, you won. 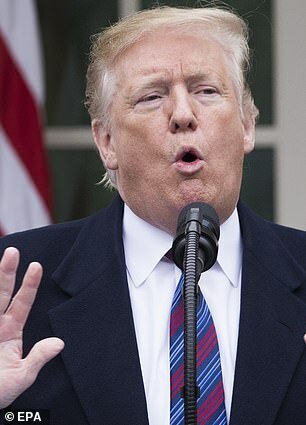 Bullies don’t win,’ and I said, ‘Baby, they don’t,’ because we’re gonna go in there and we’re going to impeach the motherf***er,’ she said. But Tlaib hit back at any critics: ‘I will always speak truth to power. #unapologeticallyMe,’ she wrote on Twitter last Friday.